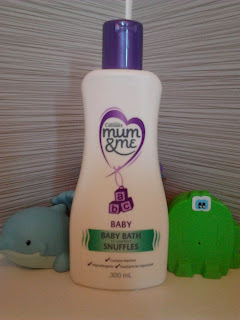 We were recently asked to try Cussons Mum & Me Baby Bath to comfort Snuffles. When we first received the Baby Bath there were no snuffles sight so I've kept it on one side. Now that the weather has changed and Joseph has returned to school the dreaded colds, snuffles and coughs have arrived! Poor little Isabella really is feeling it more than the other two. So what better time than now to try out Cussons Mum & Me Baby Bath to comfort Snuffles! I ran some of the baby bath into the warm water and as I frothed it up for some bubbles the refreshing smell of menthol was released. Along with the warm water, the menthol starts its work on the snuffles. It did cause lots of runny noses but that just shows that it is doing what it says! It really did clear out her nose! Cussons Mum & Me Baby Bath to comfort Snuffles is not only a fantastic way to comfort the little ones when they have colds. Even I have put it to the test and used it to ease my bunged up nose. However when I used it in a hot shower the menthol vapours were even stronger and worked wonders! The Cussons Mum & Me range is not only great for the babies but is also suitable for the whole family! You know that it is a range that you can trust. While any of us have the snuffles I will be keeping Cussons Mum & Me Baby Bath to comfort Snuffles close to hand!